We're at TEDxSV, a Silicon Valley outpost of TED's conferences on innovation, which is taking place today at Stanford University. 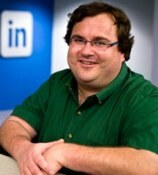 First up is LinkedIn founder and angel investor Reid Hoffman, who is addressing the concept of iMovements on the web. I'll be live-blogging his remarks. Hoffman says that one of his ambitions is to be a public intellectual, to be able to influence millions of people with innovations and change. Hoffman thinks that the internet, which is scalable and low-cost, is the optimal platform for cause-based organizations. The web is more about people than technology, Hoffman asserts. We’re at TEDxSV, a Silicon Valley outpost of TED’s conferences on innovation, which is taking place today at Stanford University. First up is LinkedIn founder and angel investor Reid Hoffman, who is addressing the concept of iMovements on the web. I’ll be live-blogging his remarks. When Hoffman invests in a startup, he looks at three things: scalability, margins and the structure. These three attributes are the same things that make web-based causes or philanthropic movements more effective. Three types of cause-based organizations have developed on the web because of this potential, which are non-profits (Hoffman highlights micro-lending platform Kiva.org as an example of this), hybrid infrastructure organizations such as Mozilla or Creative Commons, and companies developing their own cause-based movements on the web. One of the things that Hoffman finds interesting is that corporations, because they have the reach of millions of people, they can make cause-based initiatives part of their web based platform. This is exemplified by Facebook’s Causes application. The causes that success capitalize on the internet “peer play” says Hoffman. So how do you coordinate the actions of millions of people in the world to make social change? Hoffman says that micro-groups on the internet can help organize these causes effectively. The key part of the future of cause-based movements will be the boiling up of problems and issue and the coordinated intelligence and collective ideation on how to tackle these problems. There is a value in the crowdsourcing of ideas to help make social change, concluded Hoffman. We don't have much information on the Google Phone just yet. In fact, it sounds more like a party favor than anything else. However, if and when Google starts selling this thing, prepare for some of the strangest - and coolest - times in mobile we've ever experienced. What do we know? It's an HTC phone - probably the Passion, a distant cousin to the beautiful HD2 - with large touchscreen. It's GSM unlocked and everyone at Google has one so whatever the super secret specs are, they won't stay super secret for long. But what if Google starts to sell this thing? This is "a big deal" on the level of Neo learning Kung Fu in The Matrix. This means Google is making hardware.